Hear why Denis Waitley described Allen as "the Norman Vincent Peale or Earl Nightingale" of his time; his 1902 classic tells you that you already have what you need to achieve the life of your dreams: your mind. Allen's empowering words will show you the endless possibilities that await you if you align your thoughts with your goals. Your emotions are invaluable allies that serve as your inner compass. In this powerful audio, you learn how to achieve emotional mastery with Optimal Thinking, the language of your best self. Dr. Rosalene Glickman, best-selling author of Optimal Thinking, introduces you to the life-optimizing thinking that has replaced the "Think Positive" motto all over the world. She provides you with a simple Optimal Thinking roadmap to understand process and best resolve feelings as they occur. By optimizing your emotional intelligence with Optimal Thinking, you can put your best self in charge of your personal and professional life. You deserve to be rich, and this revolutionary primer on prosperity consciousness that has been enriching millions since it was first published in 1910. Wattles takes the mystery out of prosperity and describes the "exact science" of achieving financial success through creative thought. Named one of the all-time best business books by Brian Tracy! Are you ready to put your best foot forward in your personal and professional life? Learn how with Optimal Thinking. Hailed by academia and the media as the "The successor to positive thinking", Optimal Thinking is the language of your best self. In this powerful audio, Dr. Rosalene Glickman, best-selling author of Optimal Thinking, introduces you to the life-optimizing thinking that has replaced the "Think Positive" motto all over the world. She shows you how to match your thoughts and behavior with your highest vision of yourself, and how to put your best self in charge of your personal and professional life. Dr. Glickman presents a visualization exercise in which you see yourself as all you can be. By giving yourself the Optimal preview, the desired result becomes real and concrete and you condition yourself to be your best. You feel supremely competent, confident and function with an optimal mindset. So don't just be a positive thinker. Be an Optimal Thinker. Perform at your peak in business, bring out the best in all around you, and make the most of your life. Advice about starting a business never sounded like this! Beginning with "you must be crazy," serial entrepreneur and angel investor Barry Moltz offers the true insider's scoop on new business start-ups. With doses of irreverence and humor, the return-to-basics guide focuses on what comes before the bottom line. Addressing passion-the ultimate entrepreneurial fuel-relationships, failure, and authenticity, Moltz incorporates stories from his entrepreneurial colleagues and shows what it takes to integrate personal and professional life to achieve the highest satisfaction. Moltz describes the ups and downs and emotional trials of running a start-up business and invites listeners to let go of the myths and expectations that can hamstring them emotionally while getting their businesses up and running. In a helpful, heartfelt, and often humorous way, Moltz reassures entrepreneurs that they are not alone-whatever their form of craziness-and that they can retain self-worth and sanity as they ride the start-up roller coaster. A SLAM DUNK for sport's widows! Get onto the court and into the game with a relationship slam dunk that will lead you straight into his center circle. Connect with your favorite guy just in time for the NBA Playoffs! It's time to end the eye-rolling and join in the fun. In her exciting follow-up to "A Woman's Guide to Football", lifelong sports enthusiast Paula Duffy hits the court with the clock running to explain the basics of basketball and what all that screaming and yelling is about. A firm believer that a little sports knowledge can go a long way, Duffy says "sports talk is the most easily learned and best way to break the ice in any context…at home, in business or at play. I am here to debunk the myth that men don't like to talk. Men do like to talk…sports." From the first jump ball to the final second on the clock, Duffy will teach you in a most entertaining way, the basic rules of the game, information on the players and what they do, common terms used by announcers and how to use what you've learned to get and keep a guy's attention as you "Talk Sports". So move from the sidelines to the court and cozy up with the fan you want to get to know, or a boyfriend or husband you want to know better. Are you really motivated to achieve your dreams? The answer may surprise you. Research shows that as many as 80% of us over-estimate our level of motivation. No wonder so many dreams die unfulfilled, so many goals remain forever out of reach. Think about the important goals you could achieve if you were truly motivated. Don't you owe it to yourself to give them your best possible shot? Motivation expert Todd Beeler has drawn on the latest findings on motivation from over 100 researchers to develop his proven-effective program, which has helped thousands of clients finally unlock their full potential. The Seven Hidden Secrets of Motivation combines the insight and wisdom of psychology, philosophy, and spirituality into a one-of-a-kind program that harnesses the power of cutting-edge theory and distills it into down-to-earth, pragmatic applications. Hail Mary, Sports Widows! Get off the bench and into the game with a relationship kick off that will lead you straight into the end zone. In less than an hour, you can learn all the football basics you need to help you connect with your favorite guy. Join in the fun as Paula Duffy, lifelong sports enthusiast and founder of Incidental Contact (www.incidentalcontact.com), a sports learning site for women, entertains you with the basic rules of the game, information on the players and what they do, and common terms used by announcers as well as how to use what you've learned to get and keep a guy's attention as you "Talk Sports". A firm believer that a little sports knowledge can go a long way, Duffy says "sports talk is the most easily learned and best way to break the ice in any context…at home, in business or at play. I am here to debunk the myth that men don't like to talk. Men do like to talk…sports". So ladies, your fumbling days are over. It's time to move out of the stands and onto the playing field to grab that tight end you want to get to meet, or a boyfriend or husband you want to know better. According to the Project Management Institute, more than 80 percent of a project manager's job is communication - yet most project-management guides hardly discuss it. 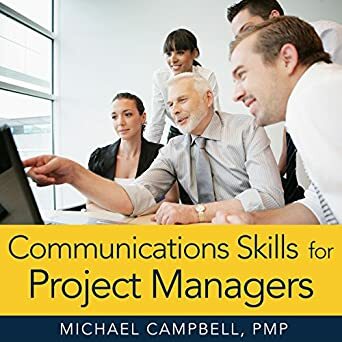 Communications Skills for Project Managers provides practical advice and strategies for ensuring success, even in the face of shifting organizational priorities, constantly evolving expectations, and leadership turnover. This important guide gives listeners the skills they need to keep everyone in the loop. Listeners will find out how they can: keep those on the project team - as well as upper management - involved and informed; establish a plan for communication; effectively present to stakeholders; compete with other initiatives within the organization; convey reasons for change; and more. Even a project that is brought in on time and on budget can be considered a failure if those outside a project team haven't been kept informed. This audiobook provides listeners with the skills they need for ensured project success, every time.